All students at the University of Michigan are obligated to adhere to the Statement of Student Rights and Responsibilities (Statement). The Statement outlines specific behaviors that contradict the values of the entire University community and, consequently, are prohibited. In addition, all University Housing residents and their guests are expected to be familiar with and abide by the Community Living Standards (CLS). 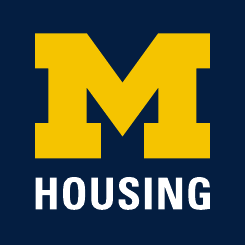 The University of Michigan and University Housing believe very strongly that each member of the University Community must take ownership of the Statement of Student Rights and Responsibilities and the Community Living Standards. Supporting and defending these standards means that students must accept them and act in good faith to see that all members of the community adhere to them. Community members are expected to report violations of the Statement and the CLS, whenever and wherever they may occur. Community members must also act in good faith at all times to ensure that they and others are not placed in situations that contradict the spirit or letter of these standards. These standards are not merely guidelines, but rather, constitute part of the legally binding contractual agreement between the resident and the University. Residents who choose to act in ways that violate the Statement and the CLS will be subject to a student conduct process. Residents will also be held responsible for the behavior of their guests. Non-resident students who engage in inappropriate behavior in University Housing facilities may be referred to the Office of Student Conflict Resolution (OSCR). The conflict resolution process for Community Living Standards is explained in more detail below. The conflict resolution process for Statement violations can be found on the OSCR Website. The complete text of the Statement and the University Policies for Students is available on the Office of Student Conflict Resolution (OSCR) website. Any question of interpretation regarding the Community Living Standards shall be referred to the Director of University Housing or designee for final determination. * Common definitions of hazing currently in use at the University can be found online. The Community Living Standards (CLS), 1.1 through 7.8, are additional expectations that apply to behaviors that violate the values of the community. All residents are responsible for adhering to and upholding the CLS as well as all tenets of the Statement of Student Rights and Responsibilities. View the full CLAM document.